Success System Revealed Reviews - Legit or Scam? Success System Revealed Reviews – Legit or Scam? Success System Revealed is a new work at home opportunity which claims to be the “#1 Income Plan” that allows anyone to be their own boss while being financially secure. According to their website, Success System Revealed has helped thousands of people build their own businesses by providing them with the training, support, and tools they need to establish their business and succeed immediately. Success System Revealed claims their system is easy to follow, and only requires you to work 1 to 4 hours a day, 4 to 5 days a week. Registration to find out more about their business opportunity is free. You simply need to fill out your name, email address, and phone number. What is the Success System? After you fill out your registration form, you will be transferred to another web page, www.NewEconomySolution.com, for Greg Montoya’s Creating Wealth From Home Pro System. This system focuses on multi level marketing, or network marketing, opportunities. Montoya is recruiting new people to his MLM opportunity, but unlike other MLM opportunities, he also promises to help you succeed. Montoya’s system claims to avoid all the old difficulties with network marketing by providing his recruits with tools like email blasts, autoresponders, and phone scripts for talking to new leads. These tools are intended to help new recruits bypass the common issues with MLM opportunities, like having to bother friends and family in order to build their initial downline. Network marketing is a legitimate form of independent, work from home business, which is rapidly changing and evolving due to the internet and the way it allows business owners to connect with possible new recruits. However, it is a difficult type of business to be successful with and requires a lot of time and effort. The promises on the Success System Revealed web page of only working 1-4 hours a day, 4-5 days with success are probably overly optimistic. Average Rating for " Success System Revealed " is 2.5 out of 5 based on 2 reviews. This work from home business is a superb idea. The details are Impressive, concise and to the point. I especially like the business system, and what it is, I believe anyone can succeed and strive for success through the multi level marketing system. 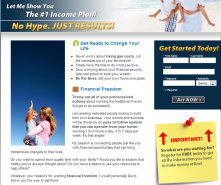 I found Greg Montoya's Home Business System to be very well planed and thought out. The network marketing can be a success for anyone who desire's to improve their life and change their financial situation. My question to you is what are you actually marketing? The Laundry Pure system that I can buy from Amazon for as little as $399 at a more advantageous rate than that or are you really marketing the MLM system itself? I think I know what the answer is. I could choose to sell the Laundry Pure system myself to Several companies affiliate programs. So what is the huge advantage?